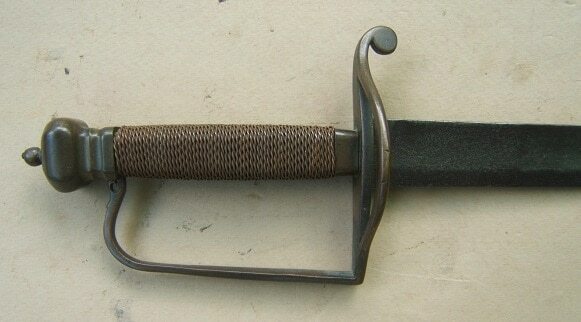 A VERY GOOD & RARE COLONIAL PERIOD ENGLISH SWORD-PISTOL, ca. 1730: In overall very good+ condition with smooth, lightly toned, silver-gray iron surfaces and a finely carved and fluted staghorn grip. The 21″, single edge, unmarked blade with two deep fullers/blood-grooves, for its length, smooth steel-gray surfaces, scattered light to moderate pitting, patches of discoloration and its original and sharp cutting edges. 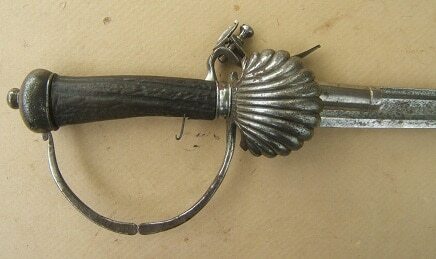 Finely chiseled steel hilt with a classic, early Georgian form, scallop-shell cross-guard, a sculpted and faceted “D” type knuckle-guard and a bun-type pommel with a finely turned capstan with its original “tang-peen”. Finely molded and carved, deeply fluted, dark colored, staghorn grip-scales with smooth, untouched “natural” surfaces, their turned iron ferule and some minor expected signs of use, wear and abrasions. 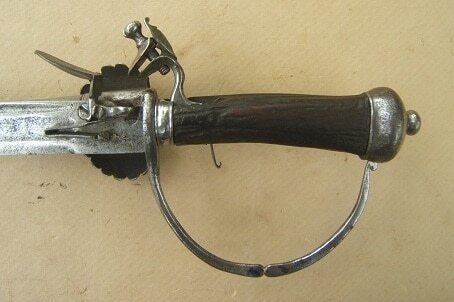 In overall very good+ condition and complete with its original, integrally-mounted, sidelock flintlock mechanism. The lock of typical “Queen Ann” design with a bridled powder-pan, a finely sculpted gooseneck hammer and a trefoil finial frizzen spring. In mechanically functional order (mainspring weak) with its original curled trigger, screws and matching mottled surfaces. Cannon form, 3″, smoothbore, .45 caliber, turnoff, Pistol barrel with matching steel-gray surfaces and a fine bore and touch-hole. 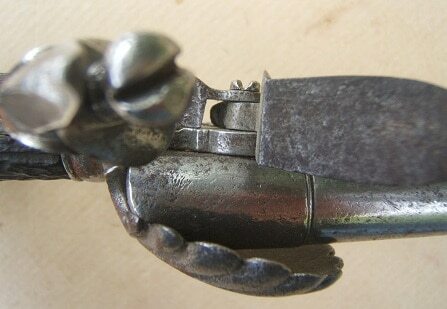 In very good+ original flintlock condition and classic example of an authentic English Flintlock Sword Pistol, ca. 1730. Very good blade with smooth surfaces, sharp cutting edges, a fine point, minor nicks and some light scattered discoloration and salt & pepper pitting. Overall length, 27 3/4″. Complete and original throughout with some expected signs of use and wear. 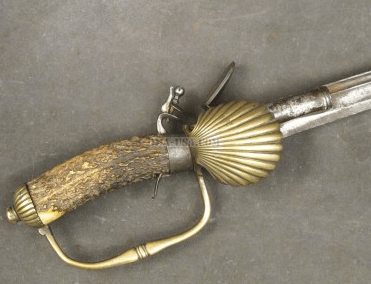 A scarce example of an authentic 18th Century “Combination Weapon”. For similar examples please see Claude Blair’s: “Pistols of the World”, plt. 726 & 727.